Try our new Structured Data Codelab. This codelab walks you through adding several types of structured data to a simple HTML site, including where to place structured data on a site and how to validate it. Google Search works hard to understand the content of a page. You can help us by providing explicit clues about the meaning of a page to Google by including structured data on the page. 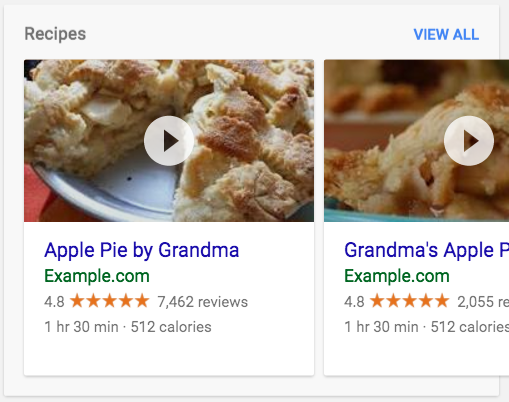 Structured data is a standardized format for providing information about a page and classifying the page content; for example, on a recipe page, what are the ingredients, the cooking time and temperature, the calories, and so on. Because the structured data labels each individual element of the recipe, users can search for your recipe by ingredient, calorie count, cook time, and so on. Structured data is coded using in-page markup on the page that the information applies to. The structured data on the page should describe the content of that page. You should not create blank or empty pages just to hold structured data; nor should you add structured data about information that is not visible to the user, even if the information is accurate. For more technical and quality guidelines, see the Structured data general guidelines. This documentation describes which fields are required, recommended, or optional for structured data with special meaning to Google Search. Most Search structured data uses schema.org vocabulary, but you should rely on the documentation on developers.google.com as definitive for Google Search behavior, rather than the schema.org documentation. Attributes or objects not described here are not required by Google Search, even if marked as required by schema.org. Be sure to test your structured data using the Structured Data Testing tool during development, and the Rich result status reports after deployment, to monitor the health of your pages, which might break after deployment due to templating or serving issues. You must include all the required properties for an object to be eligible for appearance in Google Search with enhanced display. In general, defining more recommended features can make it more likely that your information can appear in Search results with enhanced display. However, it is more important to supply fewer but complete and accurate recommended properties rather than trying to provide every possible recommended property with less complete, badly-formed, or inaccurate data. In addition to the properties and objects documented here, Google can make general use of the sameAs property and other schema.org structured data. Some of these elements may be used to enable future Search features, if they are deemed useful. Microdata An open-community HTML specification used to nest structured data within HTML content. Like RDFa, it uses HTML tag attributes to name the properties you want to expose as structured data. It is typically used in the page body, but can be used in the head. RDFa An HTML5 extension that supports linked data by introducing HTML tag attributes that correspond to the user-visible content that you want to describe for search engines. RDFa is commonly used in both the head and body sections of the HTML page. Google recommends using JSON-LD for structured data whenever possible. Be sure to follow the general structured data guidelines, as well as any guidelines specific to your structured data type; otherwise your structured data might be ineligible for rich result display in Google Search. See our recommended process for creating new structured data pages. Last updated April 10, 2019.